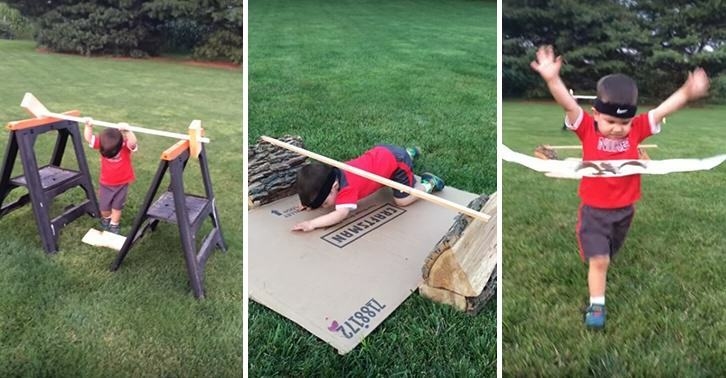 One toddler is so obsessed with Ninja Warrior that his thoughtful dad built him his own special obstacle course in tribute to the show. 3-year-old Yoshi Koge is starting his training early for the show, thanks to having one of the coolest, most creative dads ever. And this kid isn’t messing about either – just look at the sheer determination on his face, not to mention the badass headband he’s wearing while he runs the makeshift course! He started watching American Ninja Warrior about a year ago. His interest has grown over time to the point of running over and around toys in the living room during the commercials. One afternoon, Yoshi and I were in the garage and I just started pulling random items out of the garage to make a little course for him to see how he would like it. Needless to say, he loved it! It took me about an hour or so, to come up with the obstacles and the layout of the course. The ideas came from watching American Ninja Warrior along with him and trying to adapt more manageable obstacles for his size. Let’s hope that Ninja Warrior is still around when Yoshi is old enough to compete in the real thing because we reckon he’ll smash it!